Redemption Press was born out of a compelling need. On January 8, 2014, WinePress Publishing announced on their website that they were closing the business, leaving almost 2,000 authors stranded and orphaned…their books out of print and unavailable to bookstores or consumers. For 2 ½ years I’d been blogging about my bad decision of allowing WinePress Publishing, the company I’d co-founded in 1991, to be taken over by a wolf in sheep’s clothing, (www.notafraidtotellmystory.com). After doing my own extensive research, I had come to the conclusion that I’d given my credibility in Christian publishing to a bone fide Christian cult. Coupled with The Fine Print of Self Publishing’s chapter about WinePress entitled “The Worst of the Worst” and highly respected literary agent Chip MacGregor blogging twice about the litigious and un-Christlike behavior of WinePress Publishing, it was clearly only a matter of time before they would be out of business. From the time I started sharing my story and pointing out that the Williams family was taking combined salaries of over half a million dollars a year, a vicious attack was launched to try to destroy my credibility. Websites were filled with yellow journalism, half-truths, and flat out lies with one purpose and one purpose only…to poison anyone reading it towards me so that my story would not be believed. A 24 page newspaper was printed and sent to every US Postal service resident in the city of Enumclaw painting me as a sociopath and disgruntled former employee. When I left for Texas to help my brother care for my 90 year old momma in November of 2012, I told God I wasn’t ever going back to Enumclaw. Too many bad memories of being deceived…emotionally, spiritually, and financially raped by Tim Williams who was taking $21,000 a month in personal pay while authors, printers, editors, and landlords were left unpaid. The God idea of WinePress had been hijacked by the enemy and I was tired of the constant reminders being in my face every day. Well, note to self. Don’t ever tell God what you won’t do! I spent 14 months in Texas, spending the last 4 months of my momma’s life serving her and leading her to Jesus, launching a radio show called Always Faithful (www.alwaysfaithfulradio.com) and working with a handful of authors. I was happy there and had no intention of returning to the Northwest. Imagine my shock when I received a phone call on January 10 asking me if I would consider returning to Washington and starting a new company to help all the abandoned WinePress authors get back into print and distribution. When I heard the backstory of what led up to the question, I had to seriously get before God and ask Him for confirmation if this was, in fact, His will. On January 3, WinePress was evicted from their offices for non-payment of rent to the tune of $280,000. The landlord, who happens to be the Enumclaw City Attorney, proceeded to sue WinePress, receiving a landlord’s lien on everything left in the offices. Desks, computers, printers, copier, office supplies, filing cabinets, phone system, and a back-up of all the author files. The landlord felt horrible for all the authors who were now left in the lurch and wanted to see me help them if it was possible. After seeking God and wise counsel from those I trusted, it became obvious that this was the Lord leading. A good friend began helping me from Washington to set up the infrastructure for us to be able to come to the rescue and do the right thing for any WinePress author who wanted the help. It seemed to me that God was keeping her available for such a time as this, and her help in establishing the company was vital! We established a team of industry professionals who were committed to putting the author first and honoring God in the business. It was really coming together quickly! Early in January I had purchased a round trip airline ticket to visit my grandkids in both CA and WA. I was scheduled to leave TX on 1/23 for CA, and then on 1/27 for WA. It was becoming evident that when I flew out of Texas I would not be using my return flight, and plans were made to launch the company on January 27. Between January 3 and the 27th, behind the scenes everything was provided for us to contact all the authors and return their intellectual property to them, as well as offer them the option to work with us to get back into print. We started the company in the dining area of my friend’s household to make sure we kept the overhead low and were able to keep costs to a minimum to pass that savings onto the authors. Since the news broke about WinePress closing, other self-publishers were trying their best to lure orphaned authors into their offerings…the vultures were circling over the WinePress carcass and this concerned me greatly. Authors were vulnerable and I knew many could easily make a bad choice based on fear. We had decided to develop a different model than what all the companies out there were offering. One where the author is in charge and not taken advantage of with high priced packages that blur and hide the actual cost of the services you are buying. This felt like penance of sorts. These authors contracted with WinePress, many of them, because they knew me, they trusted in me, and they knew I would treat them right. Because of my bad decision, they were hurt, so I wanted to do whatever I could to make it right. And since I was the pioneer of independent publishing in the Christian market, I knew from experience the real cost of bringing a book through the process and to the market and could see that the model I’d set the standard with was not the best option for the author. Over the years, prices had been increased to the point of being more profitable for the publisher than anyone else. We wanted to start a revolution in the Christian self-publishing arena that not only put the author back in charge, but treated authors with respect, integrity and transparency, which was a far cry from where WinePress ended up after I lost control. Letting the authors know that we could provide their files regardless of whether they did business with us or not was met with a series of inflammatory emails sent to all the authors from WinePress and Tim Williams accusing me of stealing author’s personal information, files and credit card numbers. Of course he knew that all the personal and credit card information was encrypted and not available to me on the back-up, but his goal was to instill fear and distrust towards me in authors who he’d just spent YEARS stealing from. Enough authors could see through the vitriol and asked us to help them get back into print, many of whom let us know they had other books they wanted to publish. During the last 3 weeks of March, we were also able to gain access to the WinePress warehouse and insure authors who had printed large quantities of books got back what was rightfully theirs. On April 1, we officially celebrated our move back into my old publishing offices, where the former WP landlord offered us the use of all the equipment with the rental of the space. This was significant, as it was on April 1, 2010 that the business was transferred out of my name and into the name of Sound Doctrine. For God to bring me full circle, back to Enumclaw, back to the office I established before Sound Doctrine and Tim Williams were ever in the picture, and back to doing what I love…helping authors tell their story, is truly an example of His amazing faithfulness. 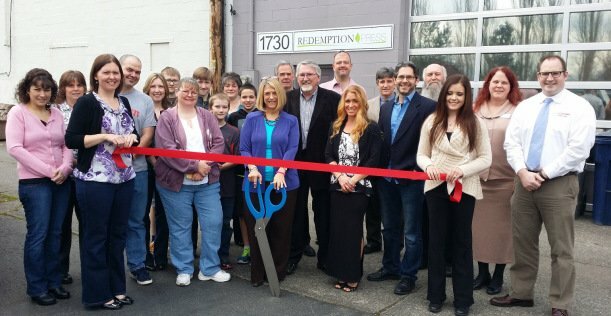 On April 1st we did an official ribbon cutting for Redemption Press and it was an incredible celebration of God’s goodness. Our next phase in business development is to widen our scope and offer publishing services a la carte, as authors need them, in a way that allows them to publish professionally and affordably. The original goal of WinePress when it was founded in 1991. So while our birth pangs came as a result of deep loss for many authors, we believe the industry will be better for it, gaining a new model of transparency and integrity in the independent publishing space. So a Romans 8:28 company you could call us, since even the devastation of the hijacking of WinePress and abuse of so many innocent authors is truly working together for good, and we are thankful for the opportunity to share His faithfulness with anyone who might benefit.